A tourist from Murshidabad died this afternoon while on a trip to Sandakphu after she complained she was having difficulty in breathing. She was administered oxygen at the local SSB camp and was being rushed to Darjeeling but she died near Kalpokhari, 7km below Sandakphu. The deceased has been identified as Benejir Begum (44) of Bahadurpur, Jiyaganj in Murshidabad district. Begum was an employee with the Sishu Siksha Kendra in Bahadurpur and was on a trip to Sandakphu along with 16 others from her locality. According to Dipankar Chakraborty, one of the members of the group, the deceased began complaining of breathing problem in the morning. She was given oxygen support at the SSB camp stationed in Sandakphu and put on board a vehicle to be taken to Darjeeling. “She used to take medication for high blood pressure. This morning after coming out from the bathroom, Begum said she was finding it difficult to breathe properly. We helped her sit on the bed and gave her medication and then took her to the SSB camp where she was administered oxygen. We got hold of a vehicle and were on our way to Darjeeling when Begum lost her pulse near Kalpokhari,” said Chakraborty. The group from Murshidabad had reached Maneybhyanjang, the starting point to Sandakphu, on October 22 and had taken a night's halt at Tumling, 13km uphill. The next day on October 23, the group reached Sandakphu around 12.30 in the afternoon. 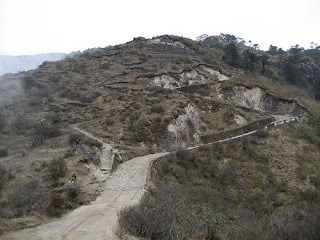 “Begum was fine in Tumling and also when we reached Sandakphu. She was enjoying the trip and was eager to reach Darjeeling town, as this was her first trip to the hills,” said Arati Roy, another group member, still in shock over the whole event. Roy said the SSB and the police had been very helpful even though she lamented the lack of medical facilities at Sandakphu, which at 3,636 metres, is the highest point of Darjeeling. “This is my third time in these hills. The road to Sandakphu is really bad and some of us even vomited on the way even though we were in a vehicle. I personally feel there should be some sort of basic health facility at Sandakphu so that emergency aid can be provided in events such as this,” she said. The group members said they had informed the deceased’s family back in Murshidabad even as the police took the body to the morgue and for a post mortem. Doctors said it was a case of high blood pressure. “She definitely had high pressure. Also it was a case not being acclimatised to the area,” said the doctor who conducted the post mortem.